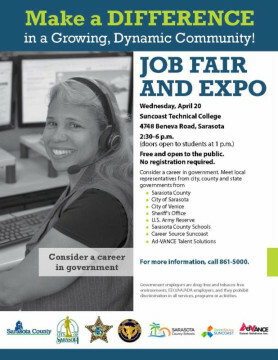 Sarasota County will host a career expo/job fair on Wednesday, April 20, at Suncoast Technical College (STC), located at 4748 Beneva Road in Sarasota, the county has announced. The free event has been planned as a means for job seekers and students to explore career possibilities within government, a news release explains. It will open to students at 1 p.m. and to the general public at 2:30 p.m., the release notes. The event will end at 6 p.m. No registration is required, the release adds. The county is hosting the job fair at SCT with the hope of attracting younger job seekers who have not considered a career in local government, the release points out. During the County Commission’s March 30 budget workshop, Whitley pointed out that she and her staff are working to expand the diversity of the county’s workforce. In addition to various Sarasota County departments, the following agencies are scheduled to participate in the April 20 expo: the Cities of Sarasota and Venice, the Sheriff’s Office, U.S. Army Reserve, Sarasota County Schools, Career Source Suncoast and Ad-VANCE Talent Solutions, the release continues. Anyone seeking employment who cannot attend the job fair may visit http://www.scgov.net (keyword “careers”) to find open positions. To learn more about the job fair or how to apply for a position, call the Sarasota County Contact Center at 861-5000.